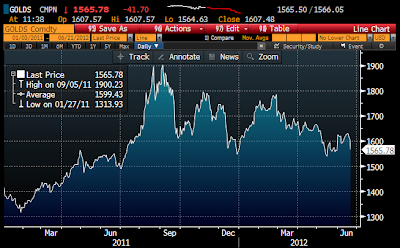 Are falling commodity prices a problem? 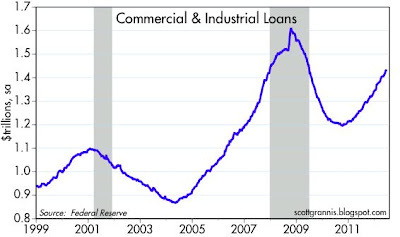 Outstanding Commercial & Industrial Loans at U.S. banks have been growing at double-digit rates for the past six months, with no slowdown yet apparent. 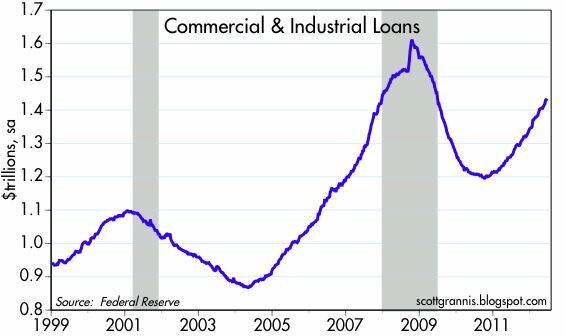 Over the past 3-6 months, loans have been growing at annualized rates of over 15%. This is one of the more impressive stories in the U.S. financial markets these days. Banks are using some of their $1.5 trillion of excess reserves to make new loans. Banks are more willing to extend credit, and businesses are more willing to take it on. This is a very positive sign because it reflects increased confidence all around and a decline in systemic risk. This charts shows the quarterly annualized growth rates for real and nominal U.S. economic growth. Market monetarists, championed by Scott Sumner, have been arguing for some time that one of the main reasons that economic growth has been so sluggish in recent years is that the Fed has failed to deliver 5% nominal growth. 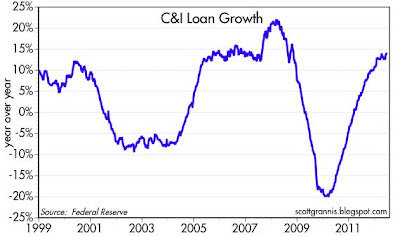 When nominal growth slips below 5%, they argue, creditors can't generate the cash flow they had expected, and so defaults rise and this further disrupts economic growth. Unexpectedly slow nominal economic growth (NGDP) is disruptive for nearly everyone because income don't rise as expected. And it makes sense to think that the economy can be disrupted when key variables (e.g., cash flows, incomes, default rates) fall short of expectations. I think he has a valid point when it comes to what happened in 2008. The worst thing that happened back then was that the financial crisis sparked by the collapse of the sub-prime mortgage market, and the housing market in general, threatened to produce a collapse of the global finance system, as loan defaults surged. The Fed was largely to blame for the intensity of this crisis—which also saw gold and commodity prices plunge—because they were very slow in responding to an overwhelming increase in the demand or dollar liquidity that occurred as the crisis unfolded. When liquidity falls short of the demand for liquidity, you have a liquidity squeeze which is effective a shortage of money. 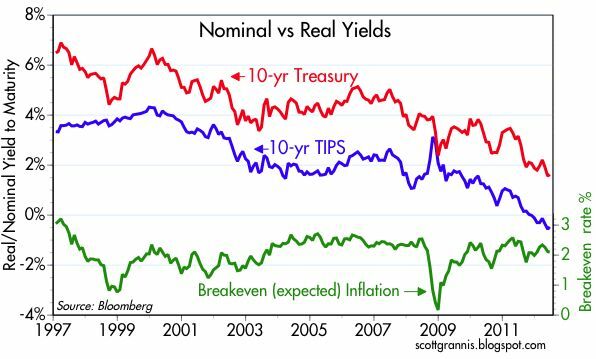 With money in short supply, deflation pressures naturally arose, as reflected in the plunge in 10-yr TIPS break-even inflation expectation to almost zero near the end of 2008, and default rates surged. But the Fed finally did react, with two rounds of quantitative easing that left the world agape with its boldness and unprecedented size. Dumping tons of bank reserves into the financial markets was the first major step towards ending the Great Recession. 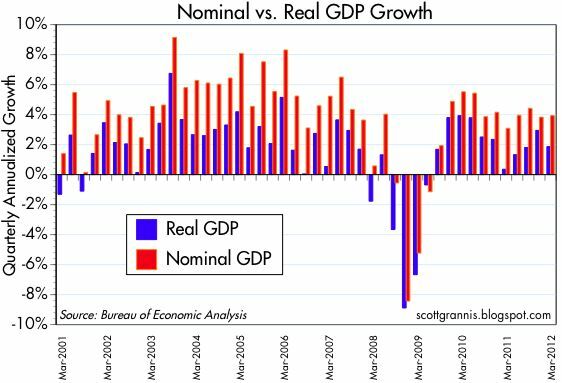 Nominal GDP rose sharply from -8.4% in Q4/08 to 4.9% in in Q4/09. Since then, NGDP has grown at a 4.3 annualized rate. That's a little shy of Sumner's preferred 5%, but not by much. So I would submit that although the Fed erred by reacting slowly to the crisis in late 2008, they haven't done such a bad job since, and thus there is little reason to fear that the economy is starved for liquidity today and otherwise vulnerable to another financial collapse or recession. QE 2 ended in mid-2011, and Operation Twist—an attempt flatten the yield curve by purchasing longer-term Treasuries while simultaneously selling shorter matures, was announced at the end of Q3/11. 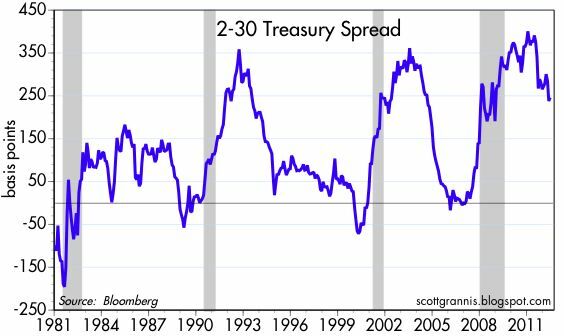 In the charts above I don't see that the slope of the Treasury curve has experienced any unusual flattening, given the stage of the business cycle we are in. 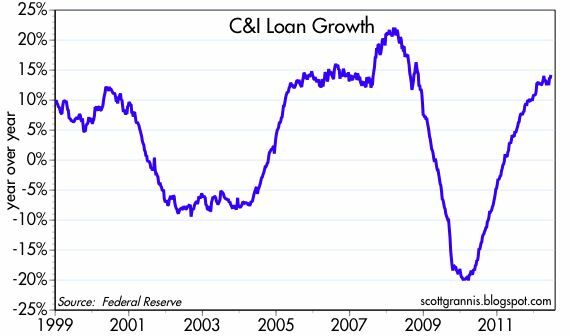 The curve is still quite steep, and that's to be expected since the Fed is still ultra-accommodative and the economy continues to grow. Furthermore, I don't detect any significant weakening of NGDP since the Fed stopped expanding bank reserves about a year ago. If the lack of more Fed easing or twisting is hurting the economy, I fail to see much evidence that this is the case. 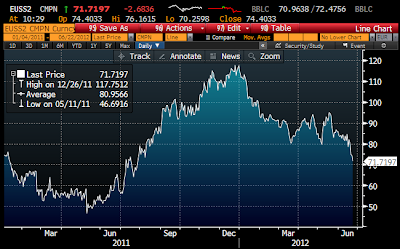 The dollar is very near its all-time lows—a fact suggesting that dollars are in relatively abundant supply. That is confirmed by sensitive market-based prices: gold is still 535% above its low of 13 years ago; and commodities are still 130% above their lows of late 2001. Credit spreads are still somewhat high, but I think that is a function of general fears which are keeping PE ratios low (at a time of near-record-high corporate profits. 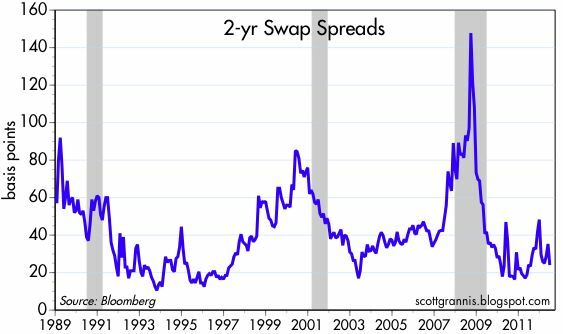 Swap spreads, on the other hand, are firmly in "normal" territory, which suggests that liquidity is abundant and systemic risk is quite low. 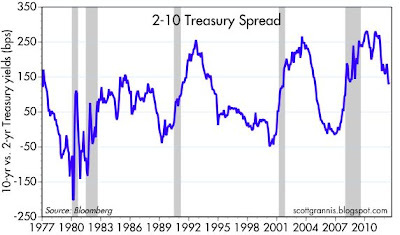 Finally, as this chart shows, if Operation Twist, if it has had any impact on the slope of the yield curve from 10 to 30 years, it's not been significant. Indeed, since the end of last September the long end of the yield curve has steepened, which inflation expectations have increase, which in turn suggests just the opposite of the Fed's intended effect. The main things holding back growth are 1) widespread risk aversion on the part of investors, as evidence in a massive accumulation of banks savings deposits, and 2) the market's very dismal expectations for economic growth, which are reflected in historically low Treasury yields. I don't see how these conditions can be altered significantly through the injection of more reserves or a further extension of very low short-term interest rates. I think it's now up to fiscal policy to make the difference: we need to bolster investor confidence by increasing the after-tax rewards to work and risk-taking (by lowering and flattening tax rates and eliminating loopholes and tax credits for favored industries, and reducing the size and scope of government so that the resources can be freed up for the private sector to work it's productivity enhancing magic. The Eurozone members have not yet solved its fundamental problem—excessive government spending—but as these charts show, they have significantly reduced the threat of a near-term disaster. The ECB's liquidity injections have been sufficient to keep financial markets liquid, allowing financial markets to play their traditional role as a "shock absorber" for the physical economy. Liquid markets permit risk to be transferred from the risk averse to the risk lovers, and there has been lots of that going on in the past two years. The biggest risk that the Eurozone has faced was the collapse of its banking system, since Eurozone banks held the bulk of the PIIGS debt. Eurozone banks have lost some 85% of their valuation in the past five years, which means that shareholders have effectively absorbed a huge chunk of PIIGS debt losses. Recent steps taken by the Eurozone members will make it easier for banks to recapitalize and continue functioning. In other words, the losses that have occurred as a result of PIIGS countries having borrowed beyond their means and squandered the proceeds of their loans are being spread around. The losses occurred in an economic sense a long time ago, and all of the sound and fury in Europe for the past few years has been about who is going to have to write those losses off on his balance sheet. Well, it's slowly getting done, and that is good, even though the PIIGS have yet to make meaningful cuts in their spending. We haven't seen the end of this crisis, not until we see credible austerity measures coupled with supply-side growth remedies. But the panic edge is off, and financial markets continue to function. 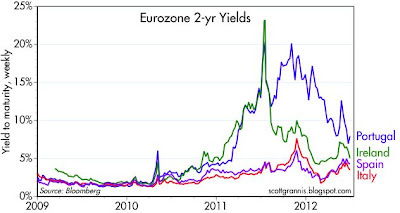 This gives the Eurozone more time to stumble around looking for the right solutions. And it gives the rest of the world some breathing room, and time to continue growing. 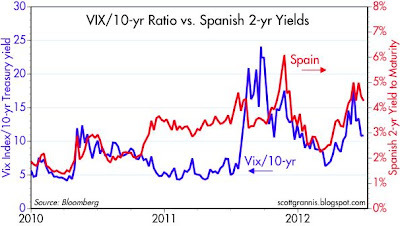 UPDATE: A chart (below) of the latest figures for Spanish 2-yr yields and the Vix/10-yr ration. This reinforces how the fears in Europe are driving fears in the U.S, and how both have declined on the margin. We're not out of the woods yet, but recent improvement is encouraging. Buying time and maintain liquid market can go a long way to mitigating the magnitude of the Eurozone sovereign debt crisis. I've written a series of posts on this subject, with this being the latest. With today's ACA ruling, the Supreme Court has now surprised nearly everyone, by 1) rejecting the argument that the mandate to purchase health insurance is constitutional under the Commerce clause (thank goodness, since that helps limit Congress' power) and 2) interpreting the penalty for not purchasing health insurance to be a tax (which is sure to make proponents of ACA flinch) and therefore constitutional. Conservatives got some limits on government, but are stuck with a massive new government program; liberals got to keep Obamacare, but are stuck with what could prove to be a hugely unpopular tax. Fatal flaw #1: The tax imposed for not buying a policy is virtually certain to be less than the cost of insurance, because the ruling stipulates that the tax cannot be coercive. This, combined with the requirement that insurance companies may not deny coverage to anyone with a pre-existing condition, and must charge everyone the same, means that a large number of people will forgo signing up for a policy, knowing that a) they will save money and b) they can always sign up later for insurance if they turn out to develop a serious medical condition. Insurance companies are thus at great risk of failure, since they will be obligated to provide insurance coverage to everyone, but not everyone will always be paying for it. Moreover, the tax collected for non-compliance will go into the government's coffers, not the insurance companies' coffers. Therefore, insurance companies will have to increase the premiums paid by a dwindling number of healthy individuals willing to pay for coverage, and/or coverage will have to be limited, and/or the government will have to subsidize the entire healthcare industry. However this works out, it will be a huge, unintended, and unpleasant consequence. The law will not work as intended; Robert's seemingly clever solution of calling the mandate a tax may prove to be a poison pill in the end. Fatal flaw #2: Regulating the price which insurance companies must charge for policies, coupled with a requirement that companies must rebate to their customers the amount by which their loss ratios fall below 90%, effectively turns these companies into government-run enterprises and would likely result in the effective nationalization of the healthcare industry. That is a violation of the Fifth Amendment, and of a Supreme Court requirement "that any firm in a regulated market be allowed to recover a risk-adjusted competitive rate of return on its accumulated capital investment." Fatal flaw #3: A government-imposed restructuring of the healthcare industry can't possibly improve our healthcare system, and is extremely likely to make it worse. As Don Boudreaux has noted, "Trying to restructure an industry that constitutes one-sixth of the U.S. economy is ... so complicated that it's impossible to accomplish without risking catastrophic failure." No collection of laws or government bureaucrats can achieve anything close to the efficiency that free markets can deliver; the demise of socialism being the most obvious proof of this. Government control of healthcare will inevitably result in higher prices and rationing, leaving everyone worse off. Fatal flaw #4: The law is riddled with loopholes. It explicitly exempts many people from paying the tax: those with religious objections (including Muslims), those not lawfully present in the U.S., those who are incarcerated, those who can't afford it, those who don't earn enough to require filing a tax return, those who are members of an Indian tribe, and those for whom coverage would represent a hardship. In cases wherein companies find that complying with the law would result in large increases in healthcare premiums that would threaten employees' access to a plan, the Dept. of Health and Human Services may grant a waiver to the company, and the list of waivers granted is already huge. As more and more people and companies escape the tax, those left abiding by it will bear a burden that at some point will become unbearable. I will reiterate what I've said before: "the defects of this legislation are so massive and pervasive that it will never see the light of day." Roberts' genius was in pushing this health care decision through without attaching it to the coattails of an ugly, narrow partisan victory. Obama wins on policy, this time. And Roberts rewrites Congress' power to regulate, opening the door for countless future challenges. In the long term, supporters of curtailing the federal government should be glad to have made that trade. Full disclosure: I have a pre-existing condition that prevents me from getting an ordinary health insurance policy, so if Obamacare survives I will benefit from its provision which will allow me to get a policy for the same cost as everyone else. Nevertheless, I still think it is a bad law because it will make healthcare worse for everyone in the end. 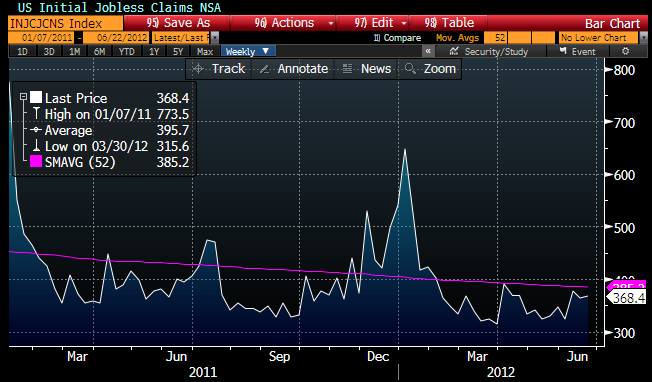 Jobless claims last week came in as expected. 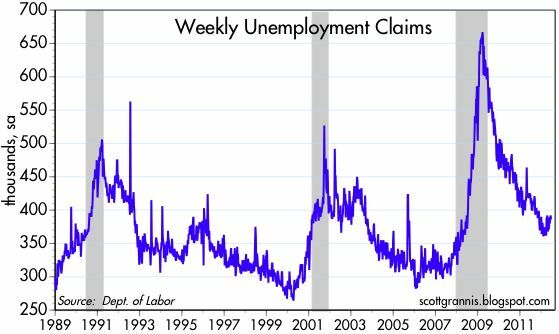 However, as the first chart shows, seasonally adjusted claims have been higher in the second quarter than they were in the first. I don't think this represents anything more than just a slowdown in the pace of economic growth, though some will take it as evidence of an impending recession. I note that unadjusted claims (second chart) were 9.4% below the level of a year ago, suggesting that the trend is still one of gradual improvement in the economic fundamentals. 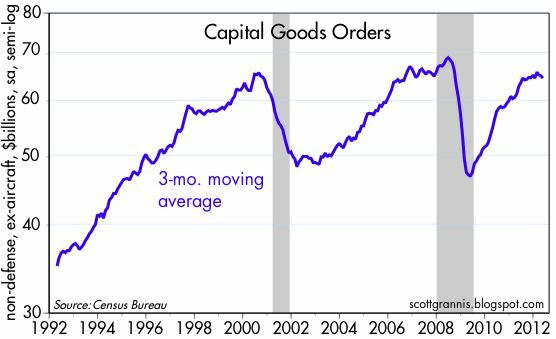 May capital goods orders (a good proxy for business investment) were up a bit less than expected (1.6% vs. 1.9%), but the bigger story is that they haven't increased much at all over the past year. Business investment has gone flat for the past year. If anything explains why the economy has been sluggish, this is it. Corporate profits are very strong, but businesses are reluctant to put those profits to work. It's not hard to understand why business investment has been flat. U.S. corporate tax rates are the highest of any developed country. Regulatory burdens have been increasing relentlessly. Obamacare threatens to push healthcare costs even higher, while adding to regulatory burdens, but until tomorrow we won't know if it is actually going to happen—that adds up to lots of uncertainty if nothing else. With the federal government spending 23% of national income, while collecting only 15.3% of national income in taxes, corporations and individuals are justified in fearing a significant increase in future tax burdens. Another to look at it: in the four quarters ended last March, total after-tax profits of U.S. corporations were about $1.5 trillion, while the federal budget deficit was $1.25 trillion. The federal government effectively borrowed and spent 83% of all the profits earned by U.S. companies. Corporations worked hard to generate profits using scarce resources in the face of increasing difficulty, but the government effectively took most of those profits and redistributed them. The profits weren't invested, they were handed out in the form of unemployment benefits, food stamps, welfare, grants to green companies that failed, and grants to state and local governments so that they could avoid cutting back on their bloated spending, among other non-productive endeavors. Government "spending" of this sort doesn't create jobs, it simply wastes scarce resources and ends up weakening the economy. With excessive government spending effectively smothering economic growth, those who are able to save end up "investing" their money in Treasury debt because the outlook for growth in the private sector is bleak and uncertainty is high. 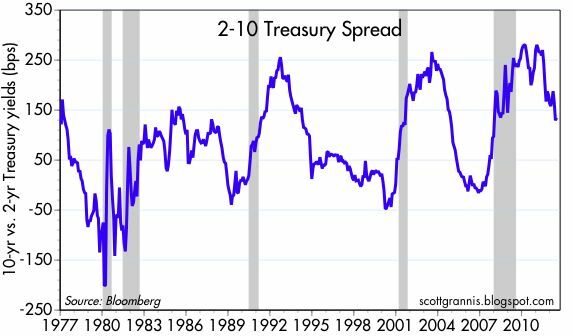 It's a vicious circle: the more government spends and borrows, the weaker the economy becomes; the weaker the economy, the more investors become risk-averse; and the more risk-averse investors become, the more they want to invest in Treasuries. 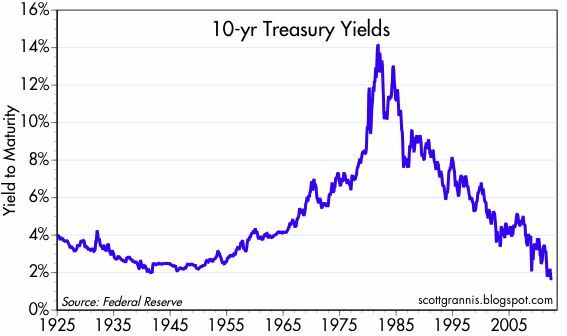 Treasury yields are at rock-bottom, all-time lows—and TIPS real yields are negative—because the market holds out very little hope for any meaningful growth or any substantial improvement in the outlook. This is the best explanation I know of for why the huge increase in federal government spending and borrowing has pushed interest rates down instead of up. The way to break out of this vicious circle is to reduce the size and scope of government, increase the rewards to private-sector risk-taking, and reduce regulatory burdens. There is hope that this will happen; after all, federal spending has already declined from a high of 25.3% of GDP in Sep. '09 to 23.3% in Mar. '12, thanks to the fact that spending has grown by less than the growth in nominal GDP. The April data (which represents an average of Feb, Mar, and April) are in, and the news is encouraging. The seasonally adjusted CaseShiller home price index was up 0.7% for the month, while over the past six months, prices are up at an annualized rate of 0.5%. 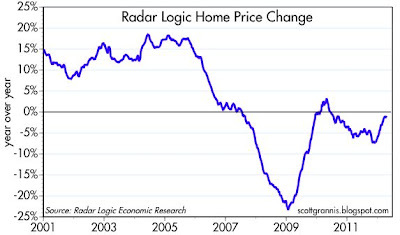 The unadjusted Radar Logic series shows that over the past year, prices have fallen by only 0.9%. 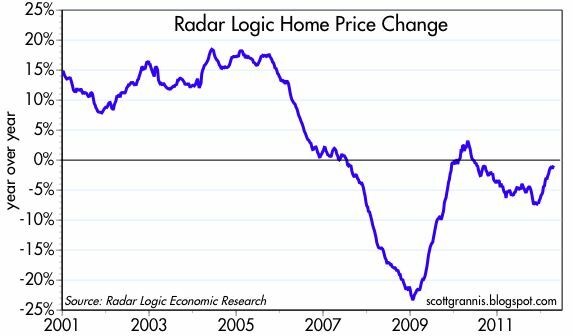 Home prices appear to be bottoming. 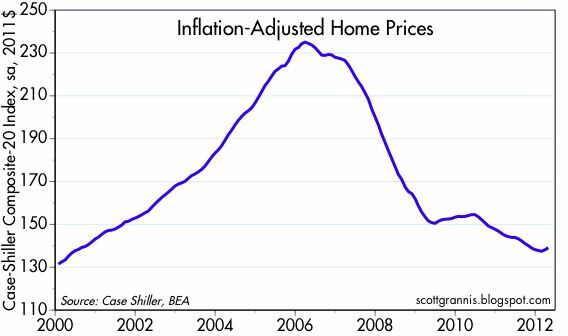 On an inflation-adjusted basis, prices have fallen by 40% from their early 2006 high. 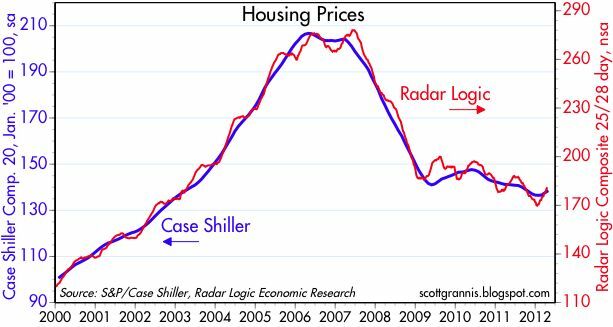 After six years of huge declines in new construction and a huge decline in real prices, the U.S. housing market is finding a new equilibrium. 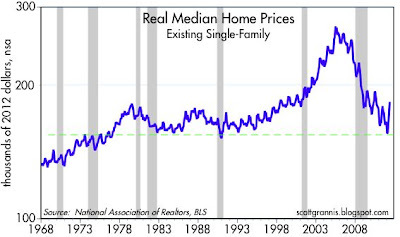 In fact, anecdotal evidence suggests that prices are now rising in many markets. Even though there is a large overhang of foreclosed real estate still on the books of banks, buyers are ever-more willing to snap up homes as they come on the market. Should the psychology of the market improve to the point where the public comes to believe that overall prices are rising, demand could easily rise to match any increase in the sales of foreclosed properties. This is how markets clear: it takes time to work off excess inventories, and it takes a change in price to bring buyers and sellers together, but we seem to have achieved both those conditions. 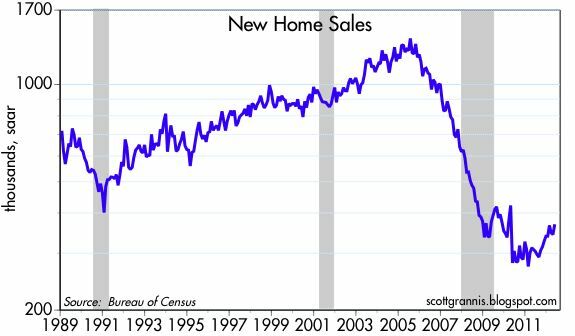 New home sales (top chart) in May were quite a bit stronger than expected (369K vs. 347K). Those who see the glass as half empty will note that sales were still extremely depressed, down almost 75% from their 2005 high. Those, like me, who see the glass as half full will note that sales were up a very strong 35% from last year's low; they will also note that housing starts, which must lead new home sales, are up 48% from their recession lows. These charts use a semi-log scale for the y-axis in order to reflect the magnitude of change on the margin in these two indicators. To be sure, the level of sales and starts remains very depressed from an historical perspective. But from an economist's perspective, it's not the level that is important, it is the change on the margin. 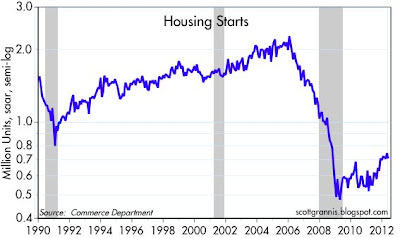 Correctly viewed, there has been a very significant improvement in the housing market over the past few years. 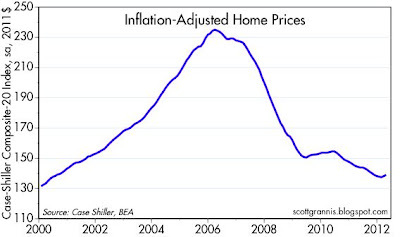 On Friday the Fed released its estimate of households' financial burdens as of March 31, 2012. "Financial burdens" are calculated by comparing debt service payments and total financial obligations to disposable income. This is very different from the number bandied about in the press these days, which compares total debt to income and implies that there is still a lot deleveraging to come. The problem with the latter is that it is an apples-to-oranges comparison, since total debt is a stock—a fixed amount—whereas income is an annual flow. The Fed's method compares flows (annual payments) to flows (annual income). Owing $100,000 with an interest rate of 10% is much more burdensome than owing the same amount with a 3% interest rate, just as it is easier to service a debt with a 10% interest rate when one's income rises 10% a year, than it is when one's income rises only 3% a year. The data for March showed a very modest reduction in financial burdens that was effectively offset by some modest upward revisions to prior data. 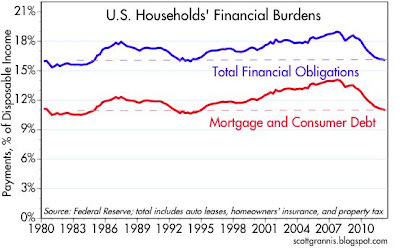 Nevertheless, the story remains the same: financial burdens have declined significantly in the past 5 years because a) households have paid down debt, b) households have defaulted on their debt, c) households have refinanced and taken on new debt with much lower interest rates, and d) household disposable income has risen. With the exception of the unfortunate cases in which households have had to default on their debt obligations, the story is a virtuous one, and it has been driven by an increase in overall risk aversion. 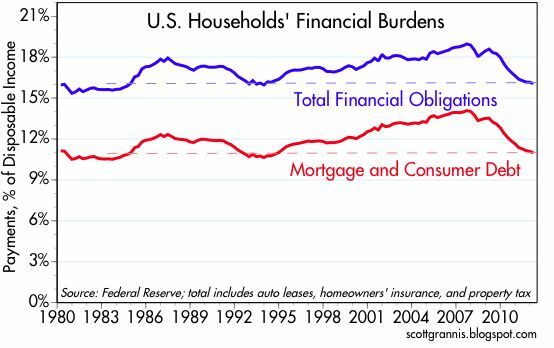 In any event, households' aggregate debt and financial burdens are now about as low as they have been for the past three decades. That amounts to some considerable adjustments, and I would argue that these adjustments have set the stage for some big changes in the years to come. For example, if confidence in the future increases, households' risk aversion is likely to decline, and the demand for money is likely to decline as well. 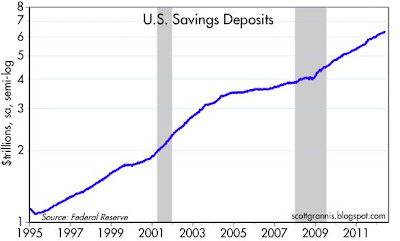 There are trillions of dollars in savings deposits that households could decide to spend. Banks' desire to sit on $1.5 trillion of excess reserves could decline, and that would mean a huge increase in banks' ability to generate new loans and expand the money supply. 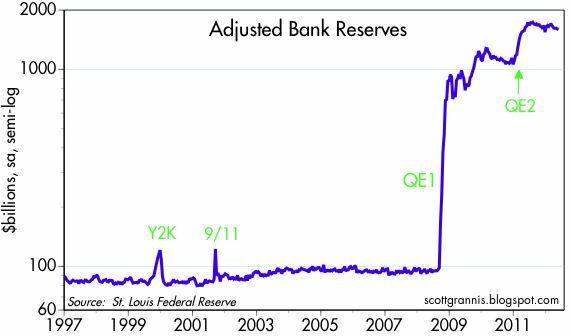 If the Fed fails to respond to these changes by reversing QE, this could result in an excess of money in the system, and that could fuel a significant rise in the general price level. In short, the next several years could be very different from the past several years. The deleveraging story has largely played out; what awaits us now is a releveraging. 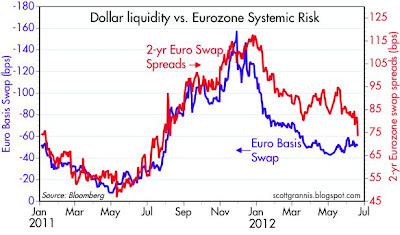 Two key measures of Eurozone risk have improved on the margin. 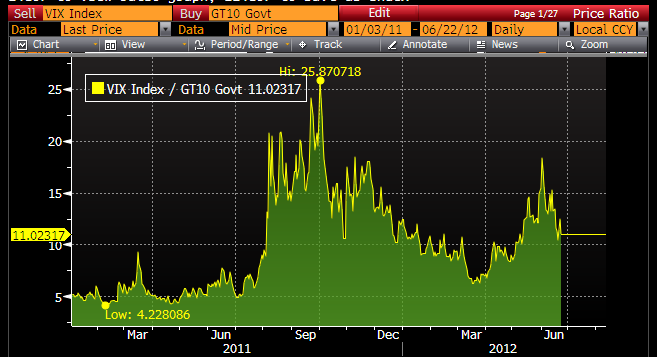 The top chart shows 2-yr Eurozone swap spreads, and the bottom shows the yield on 2-yr Spanish government bonds. Both begin at the beginning of last year for some perspective. The 10 bps decline in swap spreads in the past week or so is impressive by itself, and more so since it takes swap spreads back to the levels of late July last year, when the Eurozone crisis was just beginning to heat up. The ECB's liquidity injections have managed to restore a lot of confidence and liquidity to the Eurozone financial market, and that is an essential first step to allowing the crisis to play itself out. 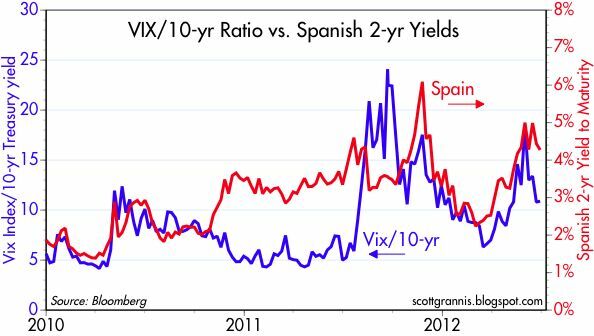 The 100 bps decline in Spanish yields is also noteworthy, if only because it shows that the atmosphere of panic has been alleviated to some extent. Instead of worrying about how much one might lose if Spain defaults over the next year, the market seems to be paying more attention to how much extra yields one might ear if Spain doesn't default. This chart of the Vix index shows that with the edge taken off of the panic in the Eurozone, U.S. markets have relaxed considerably. 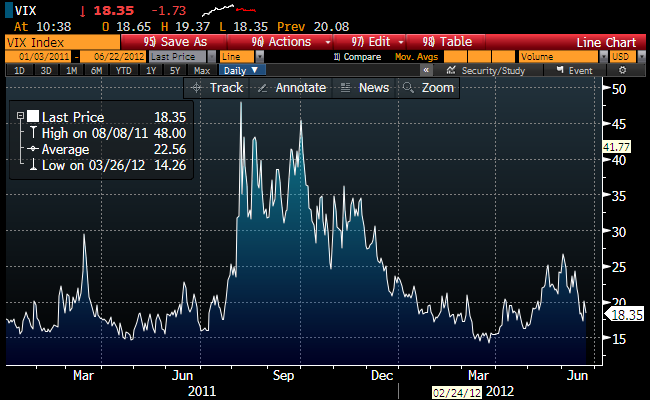 Implied volatility is still somewhat elevated, but it's nothing to be greatly concerned about. 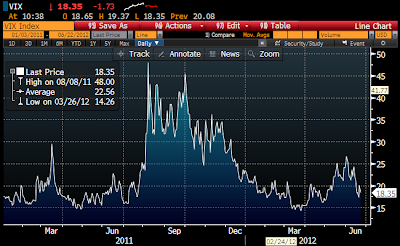 Despite the fact that U.S. markets have calmed down considerably, the Vix/10-yr ratio remains very elevated. That's mostly due to the extremely low level of 10-yr yields, and that in turn is a reflection of the market's belief that the prospects for economic growth in the U.S. and the world are dismal. Good and bad news: the risk of a catastrophe has declined significantly, but the market holds out very little hope for any significant improvement. Pessimism still reigns. "New York's $51.71/hour summer job." Thanks to a federal National Emergency Grant and some resourceful bureaucrats, this summer New York will be paying 150 youths $51.71 an hour to clean up storm damage in Fallkill Creek. The story of how a simple and necessary public works project became a full-blown boondoggle is a classic tale of government excess and regulatory insanity. Crude oil is down 31%. 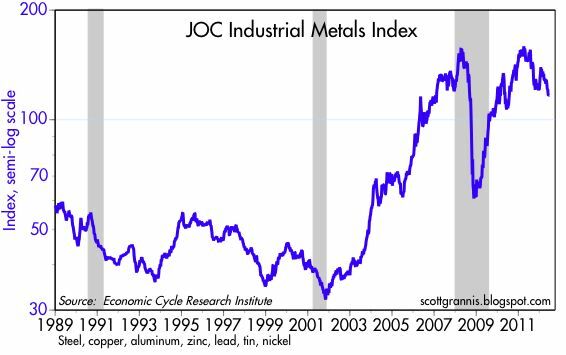 The Journal of Commerce Metals Index is down 27%. Gold is down 17%, and silver is down 44%. 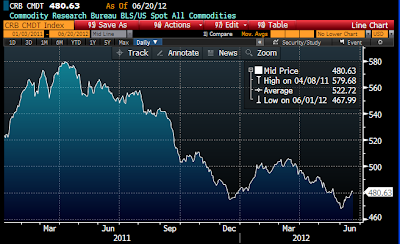 Commodity investors are suffering, no question. So what does this mean? Does this reflect a global economic slowdown that threatens to become another recession? 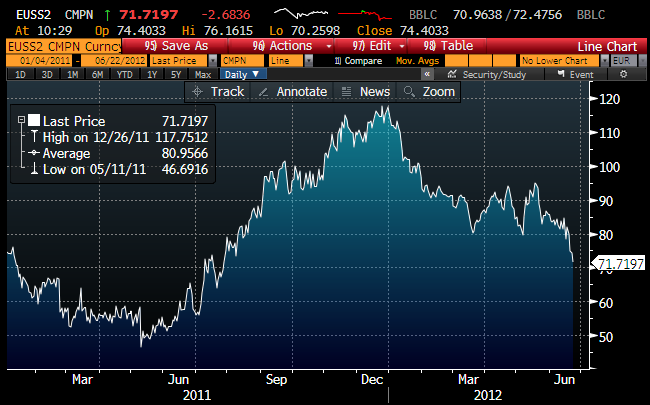 The beginnings of another bout of deflation? Is the Fed too tight? Are debt burdens killing economic growth? The answer to these questions, I would argue, is that it depends on your perspective. 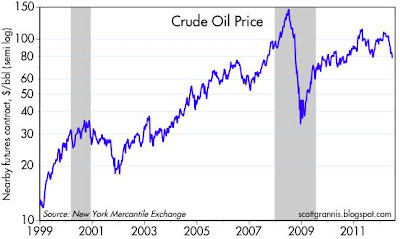 In the past 13 and a half years, crude oil prices are up 550%, or almost 15% per year. Industrial metals prices are up 260% in the past 10 and a half years, or 13% per year. 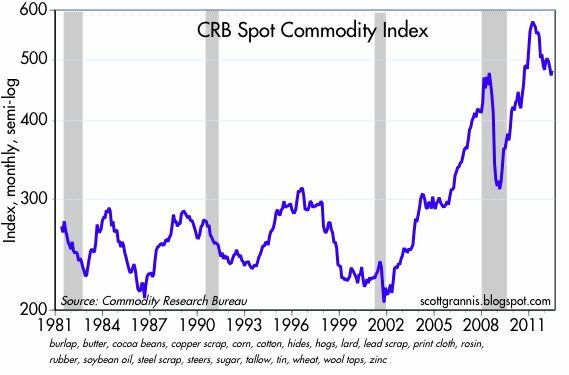 The CRB Spot Commodity Index is up 133% in the past 10 and a half years, or 8.4% per year. Gold prices are up over 500% in the past 11 years, or 18% per year. 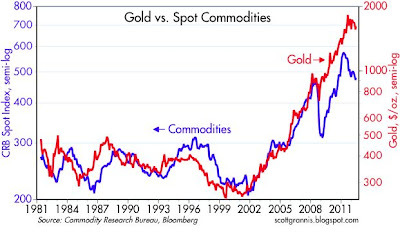 I think this chart shows that monetary policy can have a huge impact on commodity prices. The big secular trends in real commodity prices coincide very closely with the big trends in monetary policy. Monetary policy was easy throughout most of the 1970s, then became tight under Volcker beginning in 1979 and throughout most of Greenspan's tutelage. Policy has been overtly accommodative for most of Bernanke's term as chairman, with the big exception being the late 2008 period, when the Fed was slow to react to a massive increase in money demand, and thus became inadvertently tight until quantitative easing was launched. 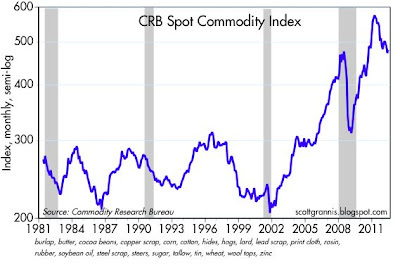 Looked at from a long-term perspective, and viewed against the backdrop of monetary policy, it looks to me like commodities are still in a bull market, and the recent declines have been in the nature of a correction. As such, I don't think that the recent decline in commodity prices, painful though it has been, reflects a major deterioration in the global economic outlook. 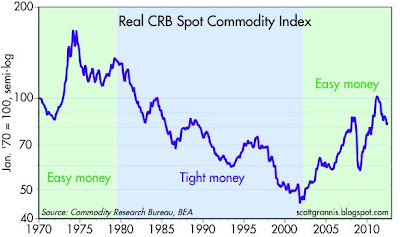 If anything, the recent decline in commodity prices is a correction from overly-strong gains—call it a bubble perhaps—that in turn were likely driven by the expectation that monetary policy was far more inflationary than it has turned out to be. 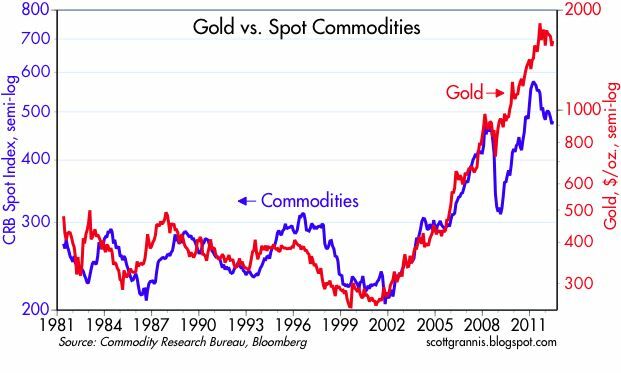 Commodity speculators—and this goes double or triple for gold speculators—are realizing that commodity prices overshot the inflation fundamentals by a lot. The future hasn't turned out to be as inflationary as they expected. Speculative excess has sowed the seeds of the commodity price drop, since dramatically higher prices have encouraged a lot of new commodity production at the same time that expensive prices have curbed demand. 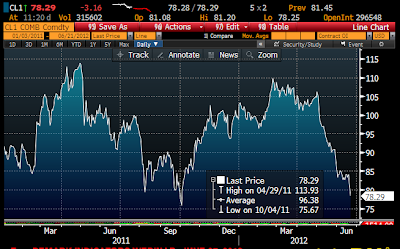 This is not an economic contraction we're seeing, its a market correction. Rather than fret over "weak" commodity prices, we should be rejoicing that oil prices are well off their highs and gasoline prices are declining. 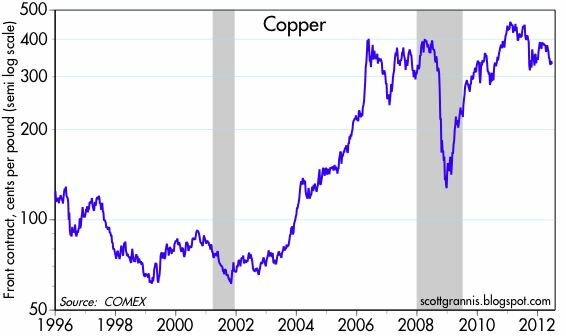 UPDATE: I thought I would add a chart of copper prices to again make the point that it's not that commodity prices are suddenly weak or suggestive of an impending or developing recession—it's that commodity prices are somewhat "less strong" than they were a year ago. 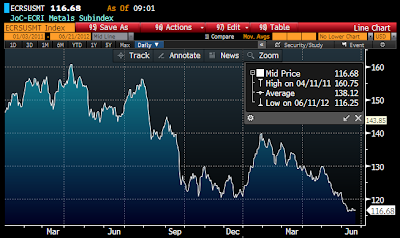 Just as monetary policy is "less easy" today than it was a year ago. 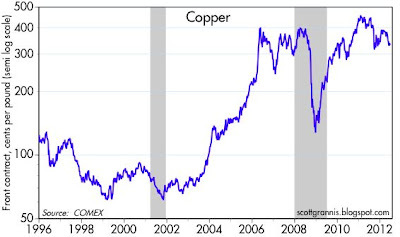 At today's price, which is almost 30% off its all-time high of last year, copper is still up 450% from its late 2001 low. I would argue that this is not necessarily indicative of any serious global economic weakness, since it could well be due to the simple ebbing of the speculative fever which drove prices to levels last year that were previously unimaginably high, coupled with the increased production that very prices have encouraged. The top chart shows real median home prices for sales of existing single family homes on a non-seasonally-adjusted basis (prices typically rise in the first half of each year, then typically decline). The bottom chart shows the year over year change in these prices in order to factor out the seasonal trends. As both charts suggest, we have likely seen a bottom in home prices, at a level that extends back to the 1970s. 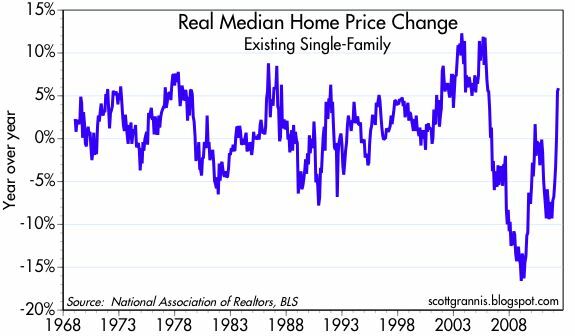 Real home prices hit decades-low levels and in effect they were even much cheaper thanks to record-low financing costs. Message: the housing market has found a market-clearing level of prices, and demand is now picking up. Demand could outstrip supply—even if all those foreclosed homes held on banks' balance sheets were released for sale—if the public begins to catch on to the fact that homes are beginning to rise in price at a time when prices are still incredibly low. The very low level of mortgage rates tells us that the demand for purchasing homes is still incredibly weak; there are likely legions of buyers who have been sidelined for fear that prices would continue to decline given the economy's ongoing weakness and the overhang of under-water homeowners. 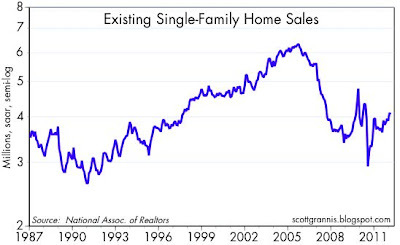 Although May sales of existing homes were slightly lower than in April, I think this chart makes the larger point that the volume of sales is trending higher from recession lows. 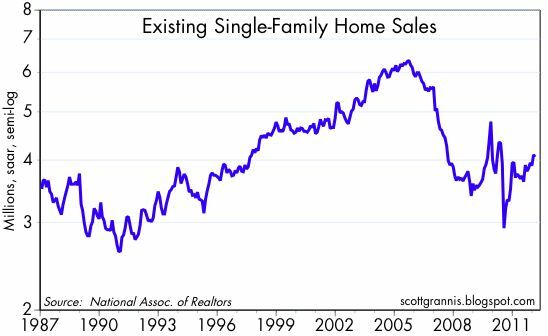 There is lots of pent-up demand and it is slowly but surely coming back. Today the FOMC announced that it did not see any reason to further increase the supply of bank reserves (i.e., there would be no QE3). But as a concession to those who still worry deeply about the economy, the FOMC did decide to extend its "Operation Twist" by buying another $267 billion of longer-term Treasuries while simultaneously selling an equal amount of shorter-term Treasuries. Stocks initially sold off, Treasuries rallied, and gold fell, all signs that the market was disappointed there would be no more quantitative easing. But as often happens, the market's initial reaction was subsequently reversed. What that tells me is that, upon reflection, the market has decided that the Fed did the right thing. We don't need more QE to get the economy going. The one thing the Fed could do to help would be to more forcefully explain to the world that monetary policy cannot stimulate growth. 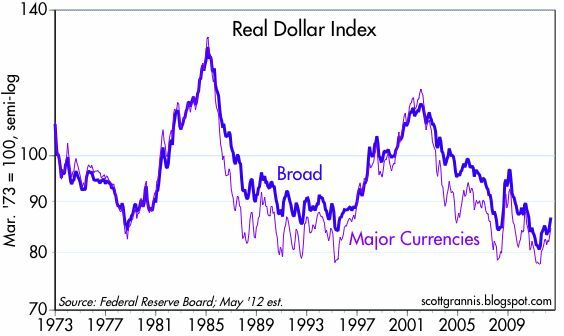 The Fed has done just about all it needs to do in order to accommodate the world's massive appetite for dollar liquidity; doing more would only risk inflation and a weaker dollar. To get the economy moving again we need stimulative fiscal policy, and by that I mean government spending cuts, a broadening of the tax base via the elimination of deductions, loopholes, and tax credits, and a lowering and flattening of tax rates. Just in case you missed it, do read David Henderson's essay today which explains how gigantic cuts in government spending at the end of WW II not only failed to tank the economy but actually led to a huge boom. The Keynesian view that cuts to government spending would hurt the economy are unfounded. With government spending now close to record post-war levels, reducing the burden of government would unleash powerful private sector forces that would almost surely boost economic growth. 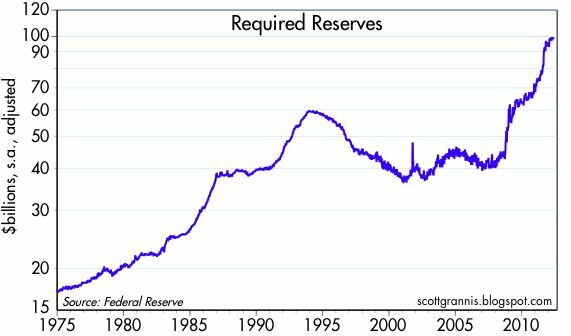 To recap the state of monetary policy, the chart above shows bank reserves, which are currently about $1.6 trillion following the Fed's two rounds of quantitative easing. Of that total, $100 billion of reserves are currently "required" in order to back bank deposits per our fractional reserve banking system. That leaves $1.5 trillion which are "excess" reserves sitting idle on the Fed's balance sheet. Banks have been slow to use the massive amount of reserves the Fed has dumped into the system via its purchases of MBS and Treasuries. That's mainly because reserves are now functionally equivalent to 3-mo. 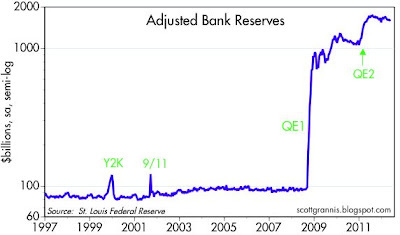 T-bills, since the Fed now pays banks interest on the reserves they hold. In fact, reserves are even better in a sense than T-bills, because reserves earn an interest rate of 0.25% while 3-mo. 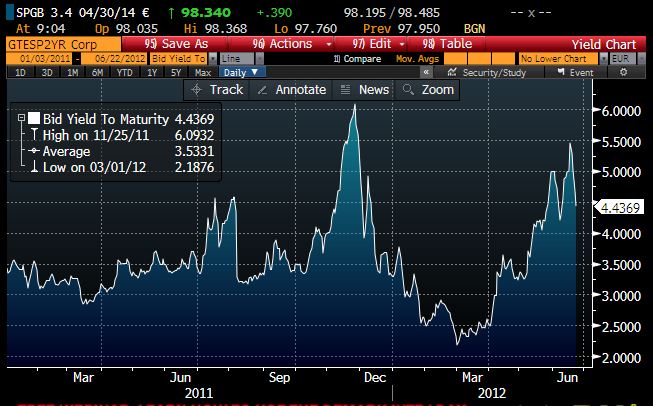 T-bills only yield 0.09%. Banks are holding reserves because they want to bolster their balance sheets and because they are still very risk averse. 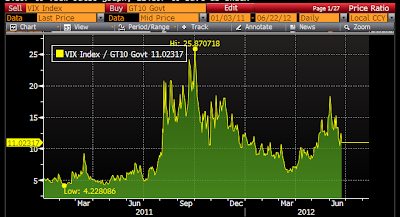 The extremely low level of yields on T-bills is proof of the intense demand for safety. Indeed, if the Fed had not engaged in quantitative easing there would have been an acute shortage of risk-free dollar liquidity, and that could have precipitated a global depression and/or deflation. The entire world in fact is still very risk averse, and you can see that in the huge growth of savings deposits in U.S. banks, which now total some $6.3 trillion. Savings deposits have surged from a low of 10.6% of GDP in 1982 to over 40%, and much of that increase has occurred over the past 4 years, as can be seen in the chart below, which shows the ratio of savings deposits to nominal GDP. Other signs that the Fed has done enough quantitative easing can be found in the following charts. 2-yr swap spreads are back to normal, a sign that the banking system is functioning normally and systemic risk is low. Banks have access to all the liquidity they need; the world is not starved for liquidity. Not only is there no shortage of dollars, there is actually a relative abundance of dollars in the world to judge by the dollar's weakness relative to other currencies. As the first of the two charts above shows, credit default swap spreads have fallen significantly from their recession highs, a good sign that credit conditions have improved dramatically. Spreads are still somewhat elevated, however, but I would argue that has little to do with Fed policy and everything to do with the ongoing Eurozone financial crisis and the extremely low level of short-term Treasury yields, which in turn is being fueled by the world's extreme risk aversion. 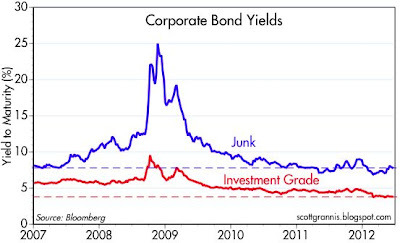 As the second of the two charts above shows, corporate bond yields are about as low as they have ever been: credit spreads are still elevated because low corporate yields are being compared to exceedingly low Treasury yields. 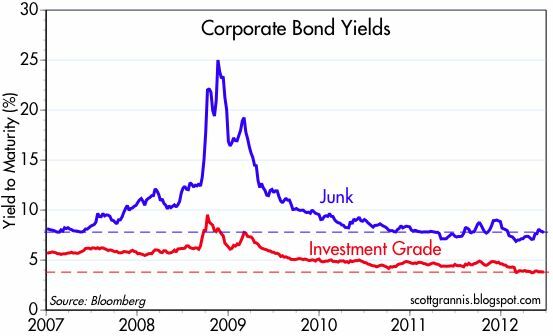 The fact that the world is happy to buy investment grade corporate debt with yields as low as 3.8% suggests the outlook for corporate profits is excellent. And indeed, corporate profits are very close to record-high levels, both nominally and relative to GDP. 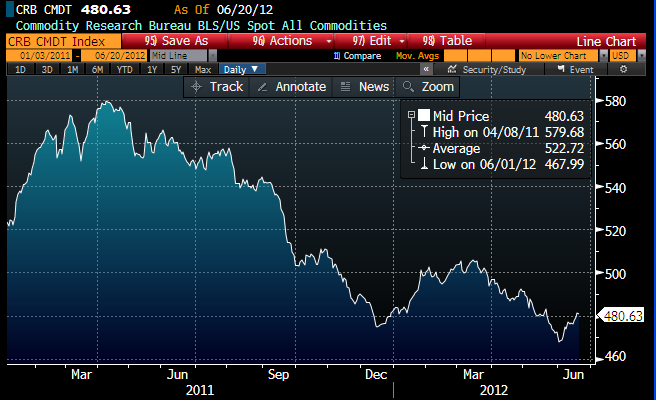 On the margin, gold and commodity prices are off their recent highs. Many analysts argue that this is a sign that the Fed has inadvertently tightened policy and that more quantitative easing is therefore necessary. 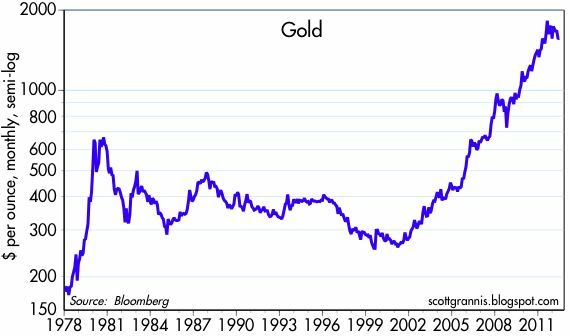 My interpretation is somewhat different: I think the recent "weakness" in gold and commodity prices is a sign that monetary policy has become "less easy." Gold and commodity prices are still trading at very lofty levels compared to where they were 10 years ago when the Fed first embarked on an ambitious program to easy monetary policy. 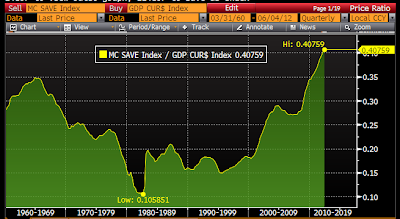 Monetary policy was indeed tight in the late 1990s and early 2000s, but that's certainly not the case today. 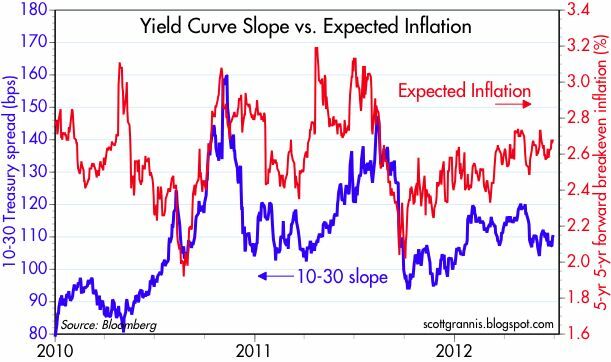 Finally, as this chart shows, forward-looking inflation expectations are not displaying any evidence at all that the Fed is too tight. This chart shows the market's implied 5-yr inflation rate 5 years in the future (i.e., the expected average annual inflation rate five years from now for the subsequent 5 years, as derived from TIPS and Treasury prices; i.e., the expected average inflation rate from 2017 through 2022), and it is right around where it has been for a long time—neither high nor low. This is the Fed's preferred measure of inflation expectations. 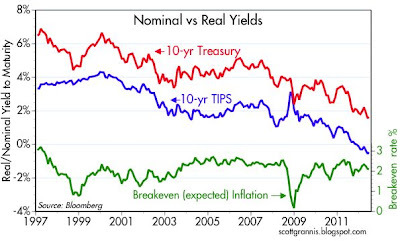 In the absence of any decline in inflation expectations, such as occurred in late 2008, and in the fall of 2010 and 2011, it would have been very hard for the Fed to justify another round of easing today. 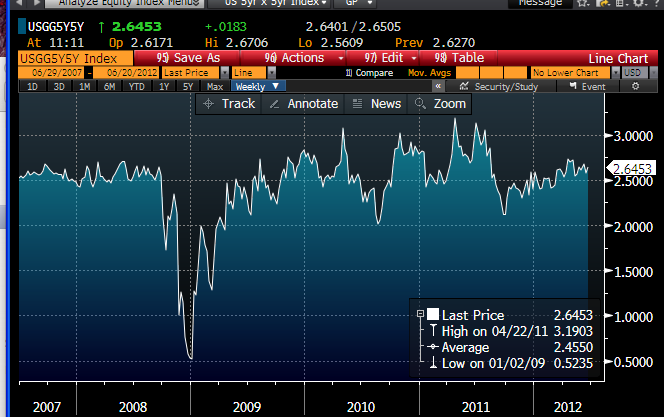 If anything, I would note that inflation expectations have increased slightly this year. As these charts show, 2-yr Eurozone swap spreads have dropped to their lowest level since last July. 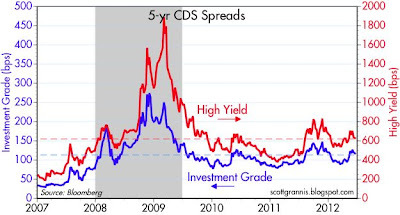 Spreads are down almost 45 bps from the late December highs, and that is a very healthy development—even though at current levels spreads are still "elevated." The Eurozone is not out of the woods by any means, but the level of systemic risk and the liquidity of the Eurozone banking system have improved significantly so far this year. 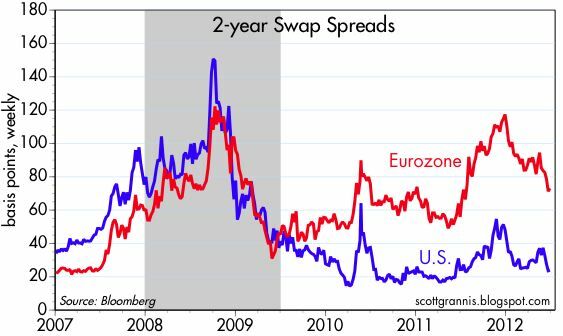 Swap spreads are often leading indicators of the health of an economy, so lower spreads are pointing to an improvement in the Eurozone economy that could become evident in the next several months. The improvement in spreads undoubtedly reflects the ECB's successful efforts to shore up the Eurozone financial system, by ensuring that banks have access to liquidity.